This is for all of the carrot cake lovers out there. 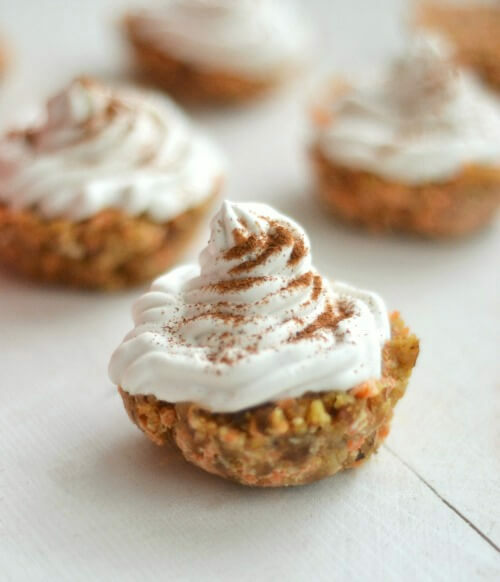 These No-Bake Carrot Cake Bites can be prepped in just minutes and are the perfect little on-the-go snack or healthy dessert. From before I can remember, Carrot Cake has always been my favorite kind of cake. In fact, I request it every single year for my birthday! Why is it my favorite you ask? 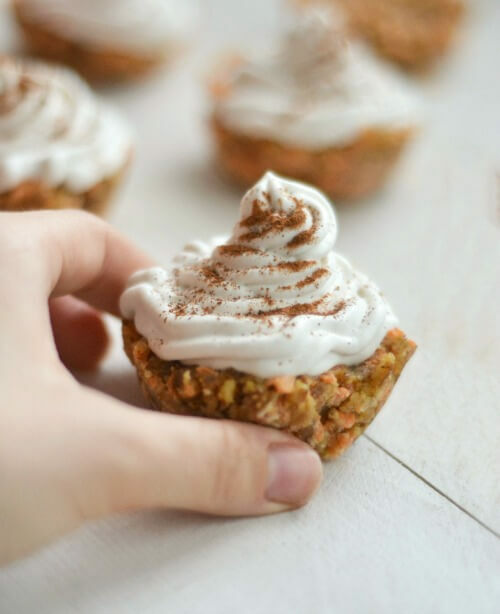 Well, these No-Bake Carrot Cake bites are super moist, crunchy and sweet, how could you go wrong? These bites are completely raw, too, but don’t be fooled, they’re totally the real deal! I decided to make these bites raw because every ingredient is special in their own way. The carrots, dates, and almonds are the perfect combination to get the natural carrot cake flavor that we all crave constantly! These are filled with good, whole ingredients to help make your body happy. These are great for breakfast, a quick on-the-go snack or even dessert! Begin by grating your carrots on the smaller side of a box grater. Gently squeeze out the excess liquid from the grated carrots. Once the carrots have been squeezed dry, measure them until you have about 1 1/2 cups. Next, in a food processor, grind the almonds and walnuts until they begin to turn into a flour, but not so much that they turn into nut butter. Add in coconut, spices, and salt and pulse for 10 seconds. Next, add the carrots, syrup, and dates to the food processor, and mix until the dates become well chopped. Using a cupcake tin with plastic wrap or wax paper strips, place about 2-3 tbsp of mixture in each cupcake hole and press down for even hardening. Place in freezer for 1 hour to harden. Cover with coconut whipped cream. Katja is an author and chef at the food and wellness blog www.savorylotus.com. Combining her experiences as a health care professional, home chef, yoga teacher, mama to 2 beautiful daughters, and as a real-food lifestyle researcher, Katja hopes to inspire people to live healthier and more vibrant lives. Her passion lies in empowering people to take charge of their heath by discovering the beauty of real food and natural remedies. You can also sign up for her FREE 10 Day Essential Oils E-Course (http://www.savorylotus.com/free-essential-oils-e-course/) to learn more about living a healthier and happier life. Read Next: Clear Out Your Sinuses And Stop Painful Head Colds With This Spicy Lemongrass Tea!